Use the corrective deed to correct an error in a previously recorded bargain and sale, warranty, or quitclaim deed in Washington State. Once a deed has been recorded, it cannot be changed and remains part of the public record. It is possible, however, to amend that record by adding a newly executed deed. The method used depends upon the reasons for changing. For corrections of minor errors or omissions, a new correction deed or re-recording of the original deed will suffice. For larger errors or to include/omit a name from the existing deed, a standard conveyance, such as a warranty or quitclaim deed, may be more appropriate. When re-recording the existing deed, use a cover sheet to reference the prior recording number, the reason for re-recording and the corrected information. The cover sheet, which is often provided by the county, must contain the following information: return address, document title or titles, reference numbers to other documents (here: the prior deed), names of grantors and grantees, entire or abbreviated legal description, assessor's property tax parcel number or account number. 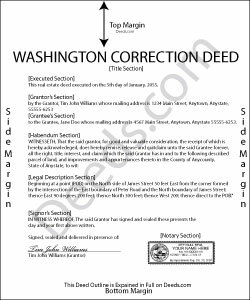 A cleaner option for amending an error is the correction deed, especially in light of Washington State's strict legibility requirements and zero tolerance for any information spilling onto the margins of the document. By restating all the information from the earlier deed, this new deed of correction will reference and confirm the previously recorded deed, which remains on record. After identifying the type of error and identifying the earlier deed, enter exactly what was in that deed with the exception of the false, ambiguous or omitted information that needs to be corrected. In both correction scenarios, submit a new excise tax affidavit, which must state the prior excise tax recording number. When filling out the affidavit, use exemption code WAC 458-61A-217, which also calls for "the recorded document number for the prior transaction" and an explanation for the re-recording. Alberta P. said: form was east to use...instructions came in handy.